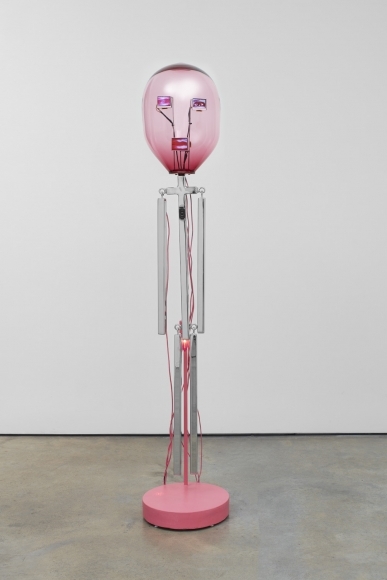 Tony Oursler (b. 1957, New York; lives and works in New York) is best known for his innovative integration of video, sculpture, and performance. While studying at the California Institute of Arts, Oursler was influenced by John Baldessari, who taught him, Mike Kelly, John Miller, and Jim Shaw the importance of the narrative potential of images and the associative power of language. A pioneering figure in new media since the 1970s, Oursler has since explored diverse methods of incorporating video into his practice, breaking video art out of the two-dimensional screen to create moving three-dimensional environments with the use of projections. At the center of Oursler’s practice is this persisting preoccupation with technology and it’s effect on humanity. In his immersive installations he presents a dissonance of moving image and sound that seeks to disorient and disarm viewers. His videos often take as their subject the human face, fragmenting and distorting its physiognomy, and thus the legibility of expression, by projecting it onto inanimate objects or embedding it into his sculptures. With these video-sculptures Oursler explores the role that the rapid growth of technology plays in altering, and often inhibiting, human social behavior. Oursler received a BFA from the California Institute of the Arts in 1979. Solo exhibitions of his work have been organized at CaixaForum Madrid, Spain (2017); The Museum of Modern Art, New York (2016); LUMA Foundation, Arles, France (2015); the Stedelijk Museum, Amsterdam (2014); Tate Modern, London (2013); Museu de Arte Moderna, São Paulo (2013); PinchukArtCentre, Kiev, Ukraine (2013); Art Sonje Center, Seoul (2012); ARoS Aarhus Kunstmuseum Denmark (2012); and Jeu de Paume, Paris, traveling to the DA2 Domus Artium, Salamanca, and the Kunstforeningen, Copenhagen (2005). Select group exhibitions featuring his work include Before Projection: Video Sculpture 1974-1995, MIT List Visual Arts Center, Cambridge (2018), Creature, The Broad, Los Angeles (2016); America Is Hard to See, Whitney Museum of American Art, New York (2015); Disembodied, Cleveland Museum of Art, Cleveland, OH (2013); Mike Kelley, Centre Georges Pompidou, Paris (2013); The Royal Family, Hayward Gallery Project Space, London (2012); Off the Wall: Part 1—Thirty Performative Actions, Whitney Museum of American Art, New York (2010); Spazio: The Scene and the Imaginary, Museo Nazionale delle arti del XXI Secolo, Rome (2010); Looking at Music, The Museum of Modern Art, New York (2008); and California Video, J. Paul Getty Museum, Los Angeles (2008). Oursler’s work is in numerous public and private collections, including the Carnegie Museum of Art, Pittsburgh, PA; Fondation Cartier pour l’art contemporain, Paris; Eli Broad Family Foundation, Los Angeles; Goetz Collection, Munich; Hammer Museum, Los Angeles; Milwaukee Art Museum, WI; Modern Art Museum of Fort Worth, TX; The Museum of Modern Art, New York; Saatchi Collection, London; Tate Modern, London; and the Whitney Museum of American Art, New York.